Tampa Red was born Hudson Woodbridge in Smithville, Georgia. His parents died when he was a child, and he moved to Tampa, Florida, where he was raised by his aunt and grandmother and adopted their surname, Whittaker. He emulated his older brother, Eddie, who played the guitar, and he was especially inspired by an old street musician called Piccolo Pete, who first taught him to play blues licks on the guitar. In the 1920s, having already perfected his slide technique, he moved to Chicago, Illinois, and began his career as a musician, adopting the name “Tampa Red”, with reference to his childhood home and his light-colored skin. His big break came when he was hired to accompany Ma Rainey. He began recording in 1928, with “It’s Tight Like That”, in a bawdy and humorous style that became known as hokum. His early recordings were mostly collaborations with Thomas A. Dorsey, known as Georgia Tom. The two recorded almost 90 sides, sometimes as the Hokum Boys or, with Frankie Jaxon, as Tampa Red’s Hokum Jug Band. In 1928, Tampa Red became the first black musician to play a National steel-bodied resonator guitar, the loudest and showiest guitar available before amplification, acquiring one in the first year in which they were available. This allowed him to develop his trademark bottleneck style, playing single-string runs, not block chords, which was a precursor of later blues and rock guitar soloing. The National guitar he used was a gold-plated tricone, which was found in Illinois in the 1990s by Randy Clemens, a music shop owner and guitarist, and later sold to the Experience Music Project in Seattle. 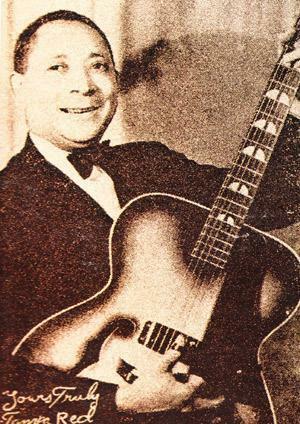 Tampa Red was known as “The Man with the Gold Guitar”, and into the 1930s he was billed as “The Guitar Wizard”. His partnership with Dorsey ended in 1932, but he remained much in demand as a session musician, working with John Lee “Sonny Boy” Williamson, Memphis Minnie, Big Maceo, and many others. He signed with Victor Records in 1934 and remained on their artist roster until 1953. He formed the Chicago Five, a group of session musicians who created what became known as the Bluebird sound, a precursor of the small-group style of later jump blues and rock-and-roll bands. He was a friend and associate of Big Bill Broonzy’s and Big Maceo Merriweather’s. He achieved commercial success and some prosperity. His home became a centre for the blues community, providing rehearsal space, bookings, and lodgings for musicians who arrived in Chicago from the Mississippi Delta as the commercial potential of blues music grew and agricultural employment in the South diminished. By the 1940s he was playing an electric guitar. In 1942 “Let Me Play with Your Poodle” was a number 4 hit on Billboard’s new “Harlem Hit Parade”, a forerunner of the R&B chart. His 1949 recording “When Things Go Wrong with You (It Hurts Me Too)”, another R&B hit, was covered by Elmore James. He was “rediscovered” in the blues revival of the late 1950s, like many other surviving early-recorded blues artists, such as Son House and Skip James. He made his last recordings in 1960. He became an alcoholic after his wife’s death in 1953. Tampa Red died destitute in Chicago, aged 77.